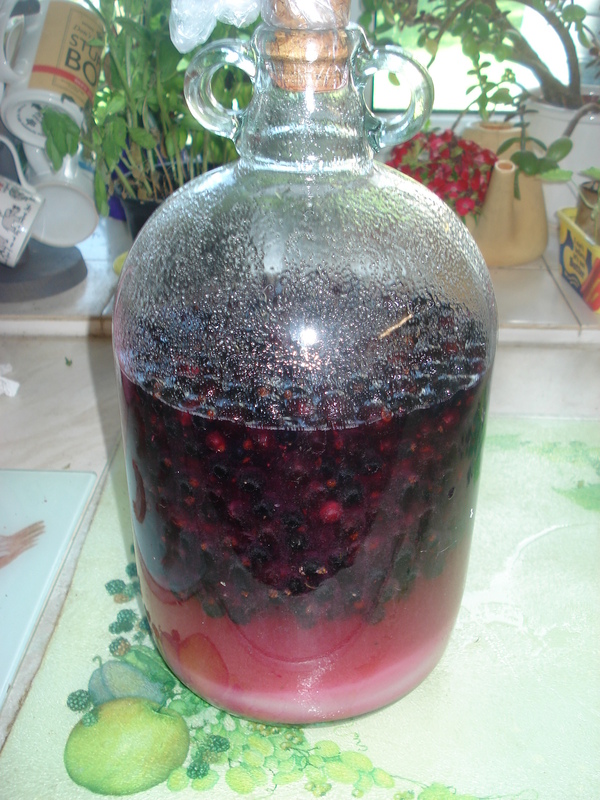 We have a bountiful crop of lovely blackcurrants this year, so apart from stewing them up and freezing them for pies and crumbles I decided this year to have a go at Blackcurrant vodka liqueur. 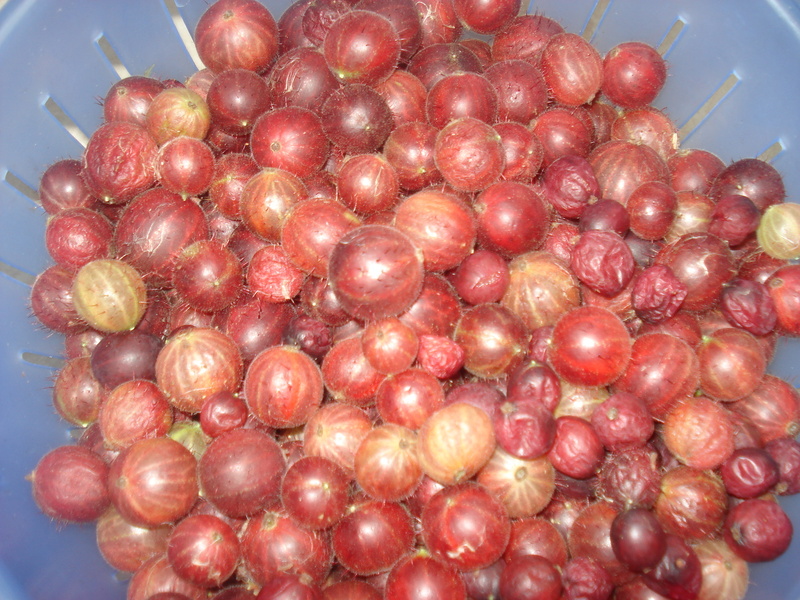 This is different from Cassis which we made last year with brandy as this uses vodka. 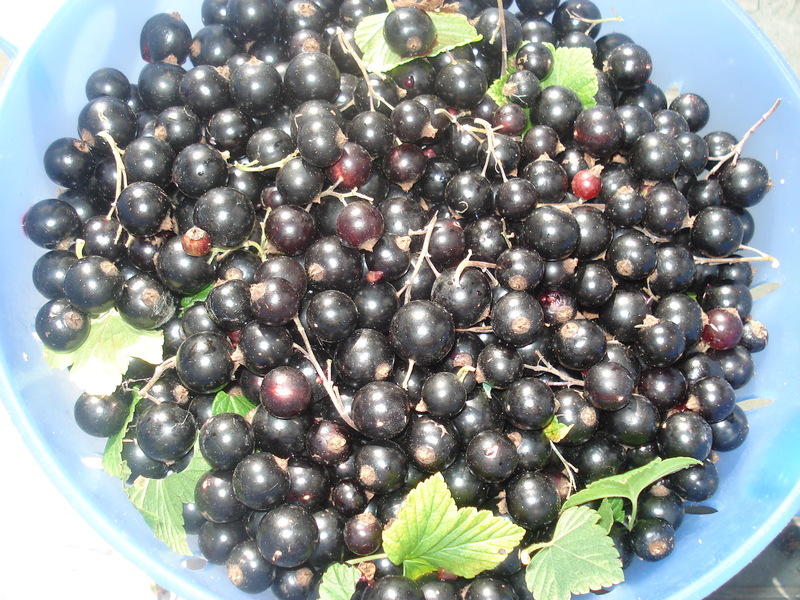 First pick your blackcurrants. 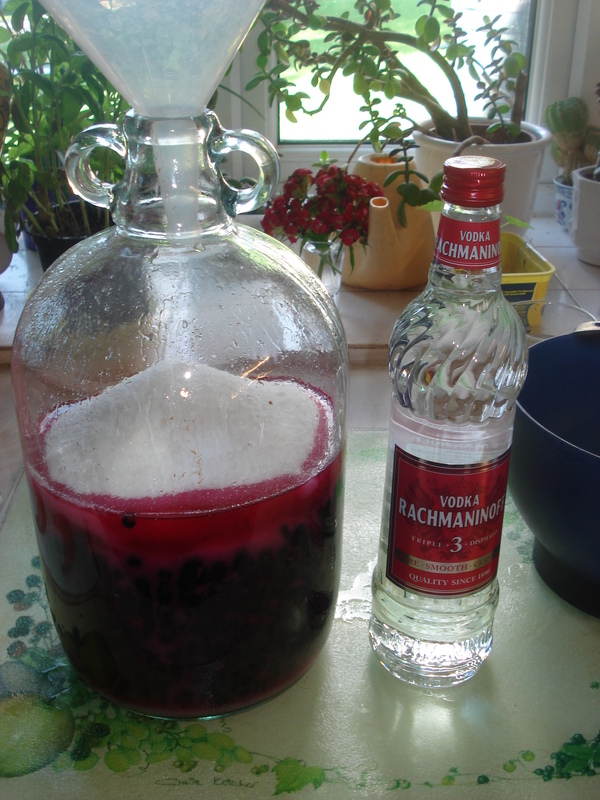 You need 750g prepared fruit for every bottle of 700ml vodka. You then have to pick it over and remove all the leaves and stalks and then wash them. 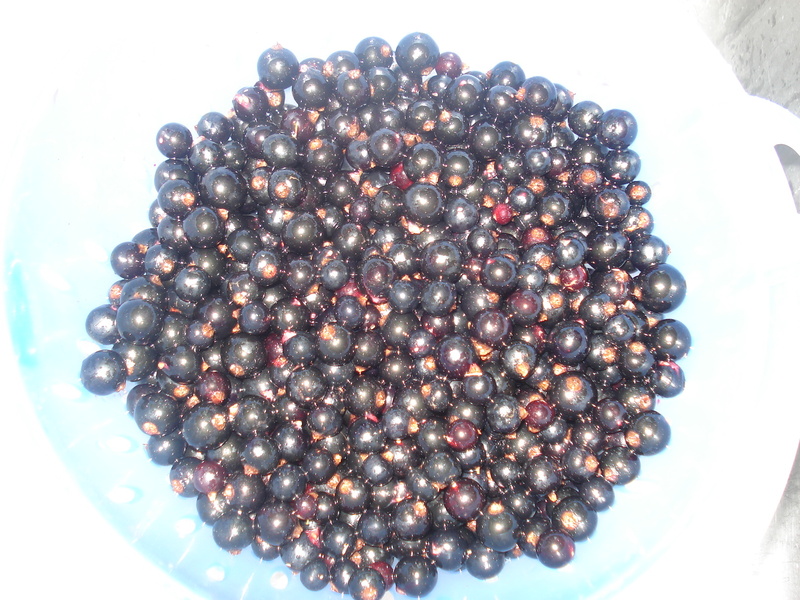 Then gradually add these berries to a demi john. You have to do this slowly and little by little or they go all over the place. Then add 750gm caster sugar. I used a funnel to tip mine in. After you’ve added the sugar, you add the bottle of vodka. We only bought the cheap stuff not the well known brand as that’s all it needs. I actually made double the quantity so this is the 2nd bottle of vodka going into mine. Then put a stopper in the top and give it all a vigorous shake. Shake daily for a week, then weekly for a month, until all the sugar is dissolved. Leave for at least 3 months to mature, longer is better. Should definitely we ready for Christmas if we can wait that long. are all the ingredients you need. 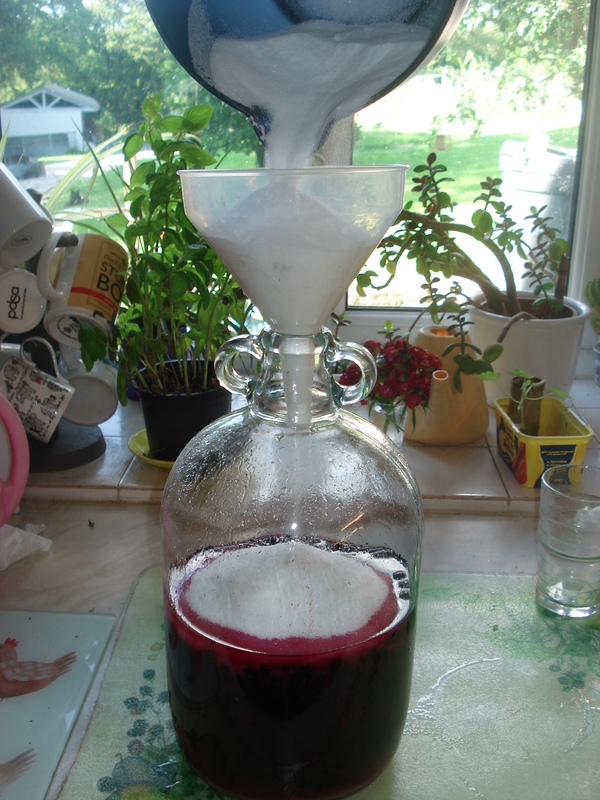 After at least 3 months strain off the fruit and you are left with delicious liqueur to bottle up. 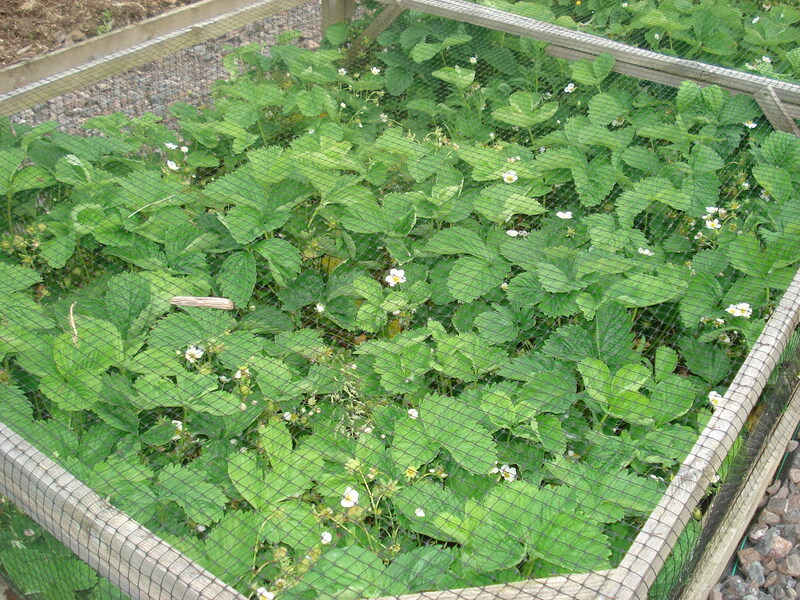 The last few days we have had glorious sunny weather and the strawberries have come on in leaps and bounds. In the week I picked a dozen ripe berries, but today I picket 2.3 kg of strawberries, that’s over 5 lbs. I think we will have an abundant crop this year so I shall be making strawberry liqueur, strawberry cordial, and strawberry jam as well as eating them every day. I do so love strawberries, they are one of my favourite fruits. 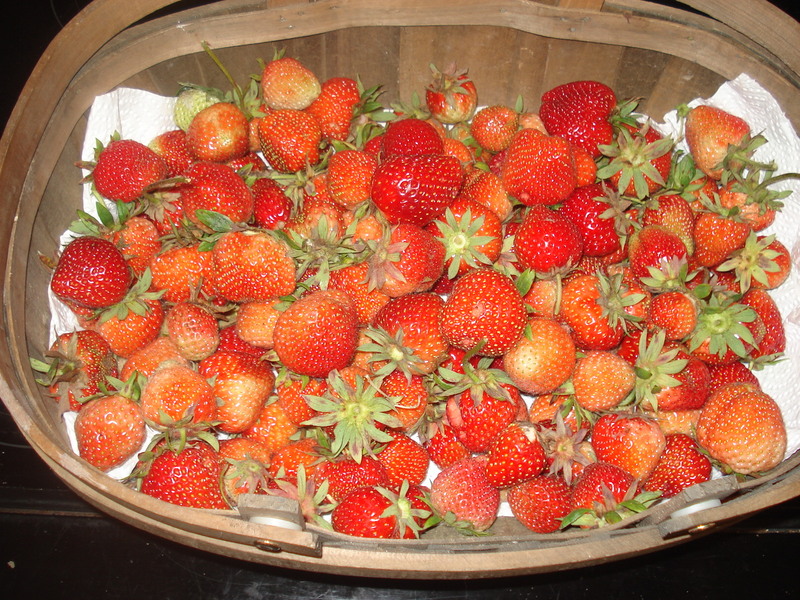 If you want fresh strawberries with your breakfast, come and stay at our B&B. 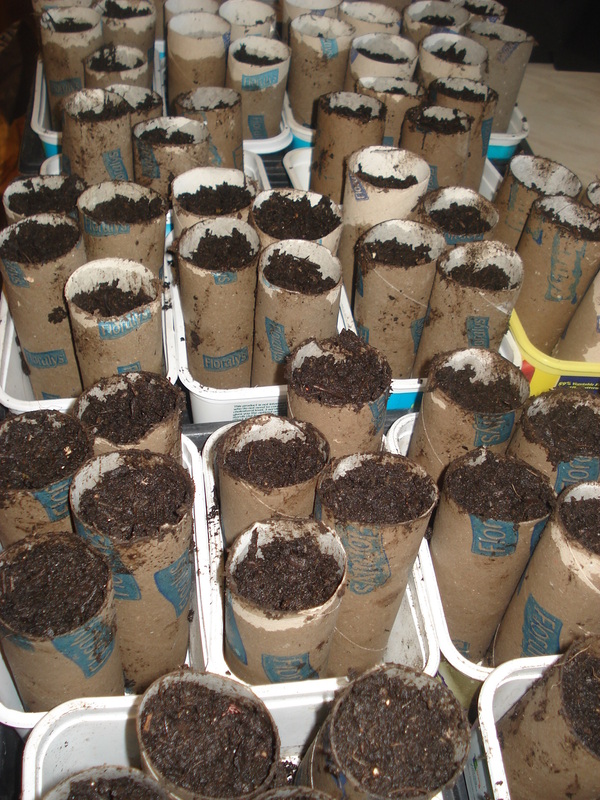 We don’t have a greenhouse yet and we do suffer from slugs and snails here as we have had such a wet Winter, so I start off our runner beans indoors in the inside of loo roll tubes. We end up with seeds growing on all the window ledges in the house. After a couple of weeks they have started to sprout. And when they are 8 to 12 inches tall I put them outside. 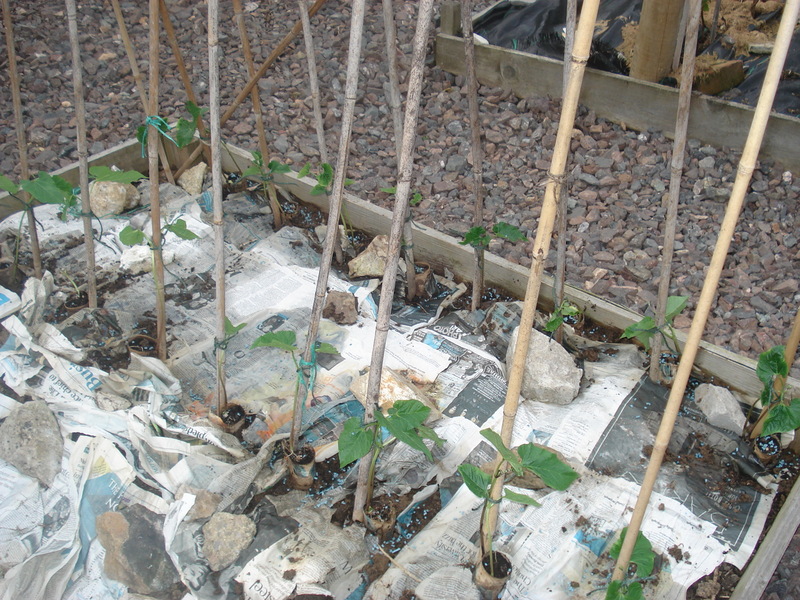 By putting the whole tube into the ground it gives the beans some protection against the slugs and snails, and gives them a fighting chance. 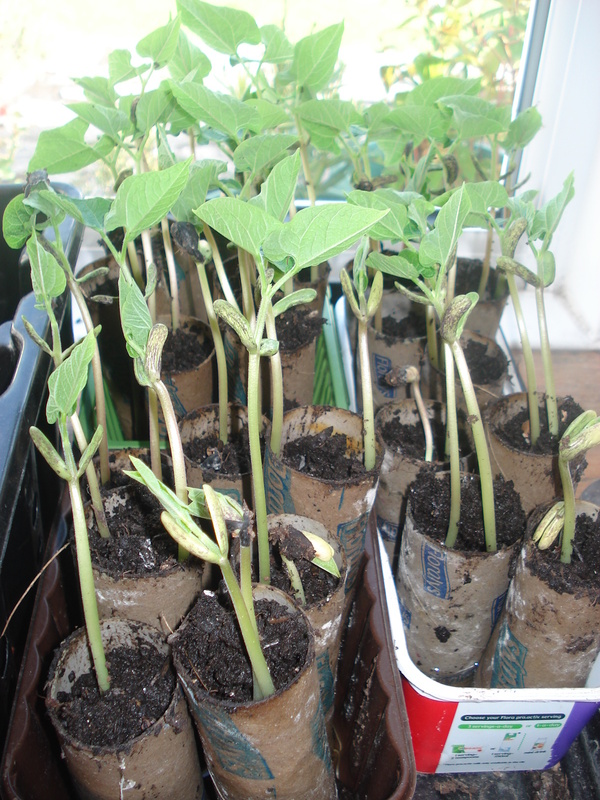 I tie each little bean plant up to its bean cane so it doesn’t get blown around in the wind. 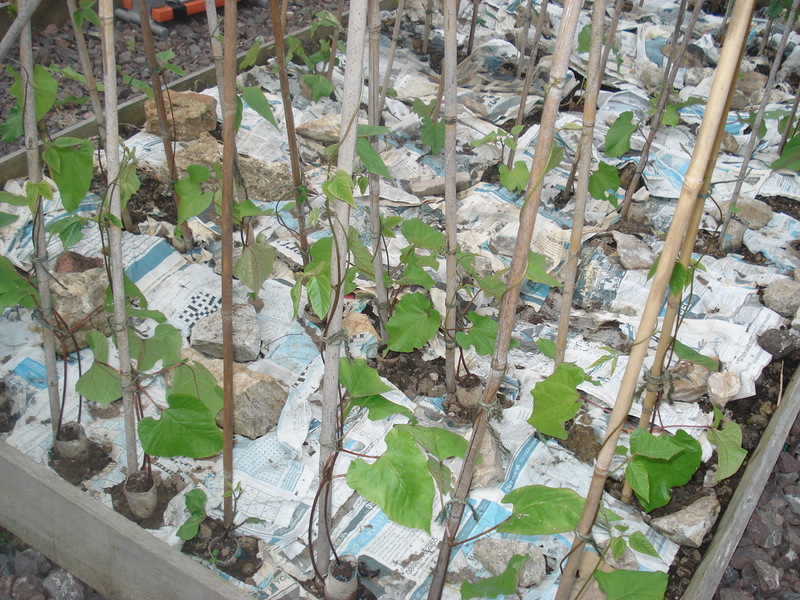 This year as part of our “no dig” experiment we have laid newspapers down around the bean poles to deter the weeds. After 10 days or so they are already climbing the bean poles, so a success. Just need to wait another month now before they produce some lovely beans for us. Our other veggies are growing well too. 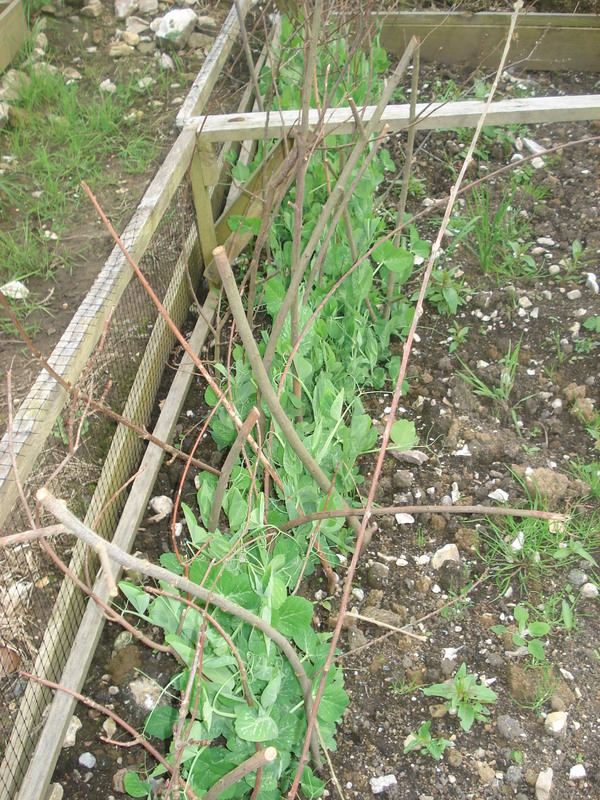 Here are our peas climbing up their pea sticks. 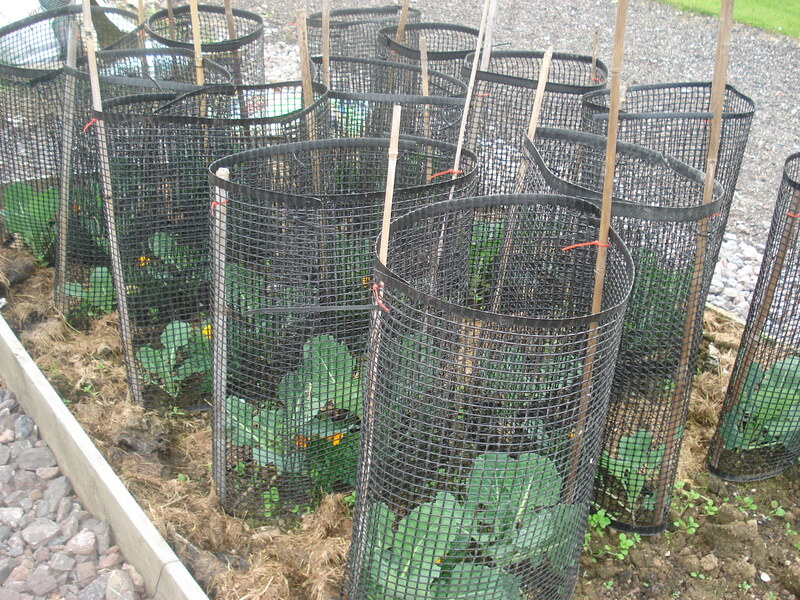 And our cabbages growing in their shrouds to protect them from pigeons and cabbage white butterflies. 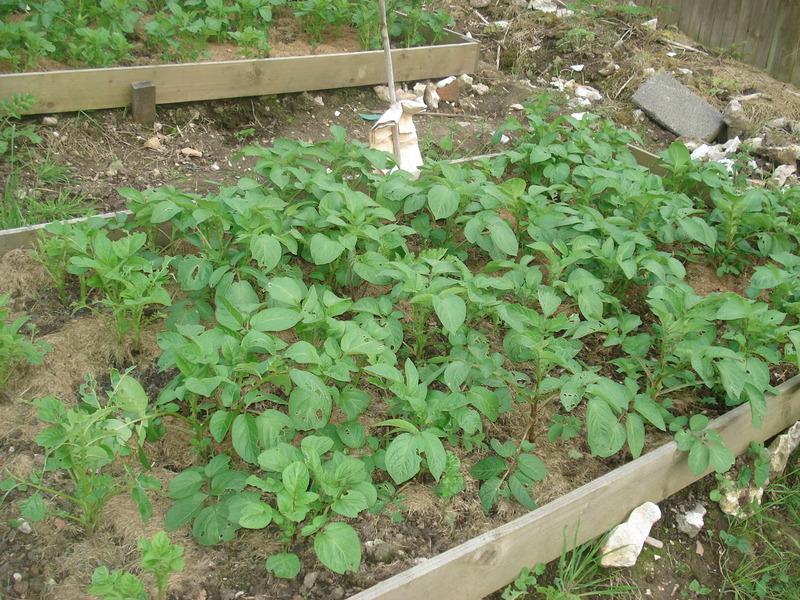 This year we spread grass clippings around the potatoes and onions as mulch and again to deter the weeds. 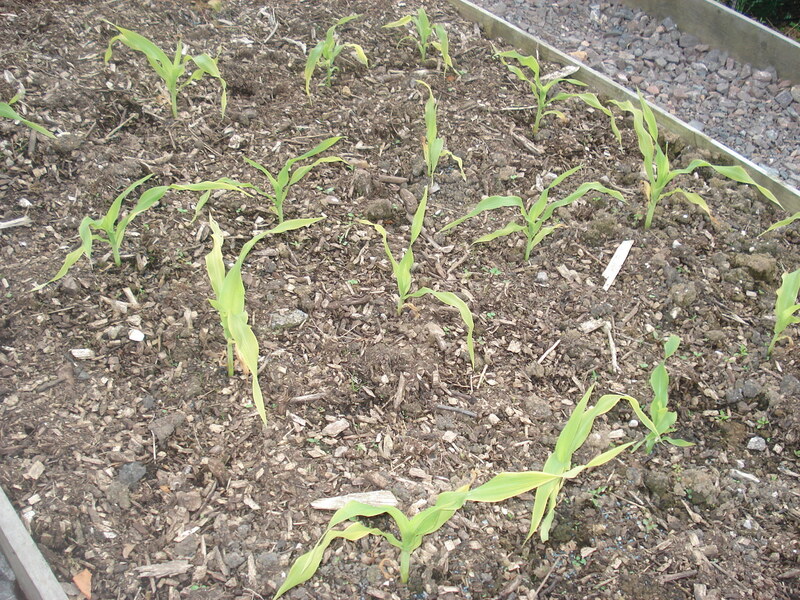 The sweet corn are still small, they need some more sunshine to boost their growth. We are also growing lettuce, tomatoes, courgettes, radish, chard, parsnips, carrots, turnips and purple sprouting broccoli so we should have lots of lovely veggies if everything grows OK. 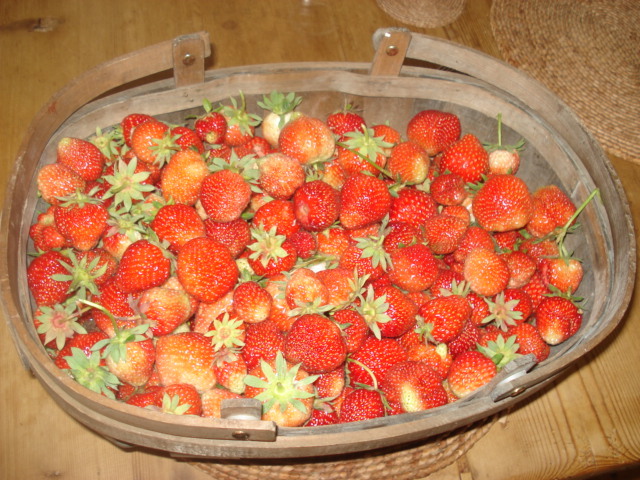 Yesterday we picked our first trug of strawberries. 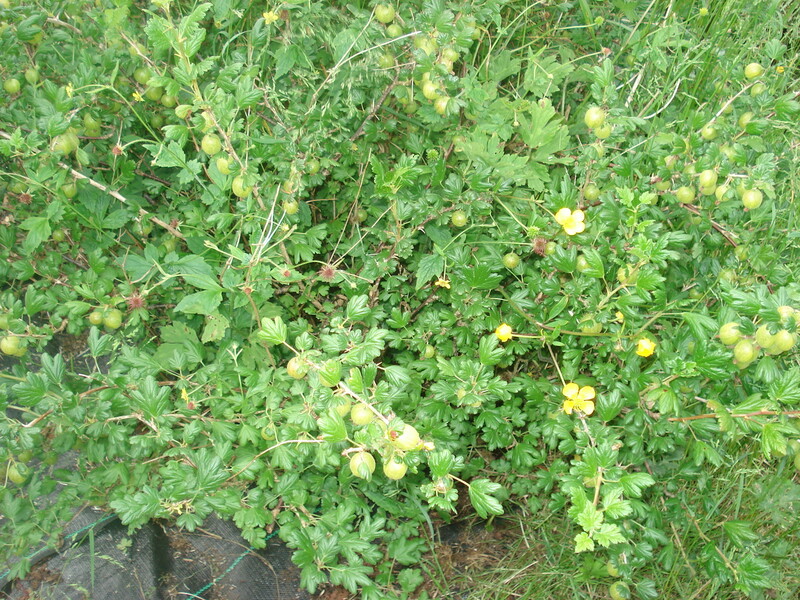 I can hardly believe how laden the plants are with fruit, there are red berries everywhere. I absolutely love strawberries and it is no problem for me to have them for breakfast, lunch and dinner and still we have enough over to make jam. I also gave some to our next door neighbours as they were eyeing them up enviously!!! Our B&B guests at the weekend had them with their cereal for breakfast. If you want to share our strawberries then come for a visit. Last year I planted a cultivated blackberry cane into the fruit cage. I started to regret this decision when the plant turned into a triffid and produced runners all over the place, but in the Summer it was covered in blossom, and the bees were all over it. I thought I might get some good fruit from it, and I wasn’t wrong. 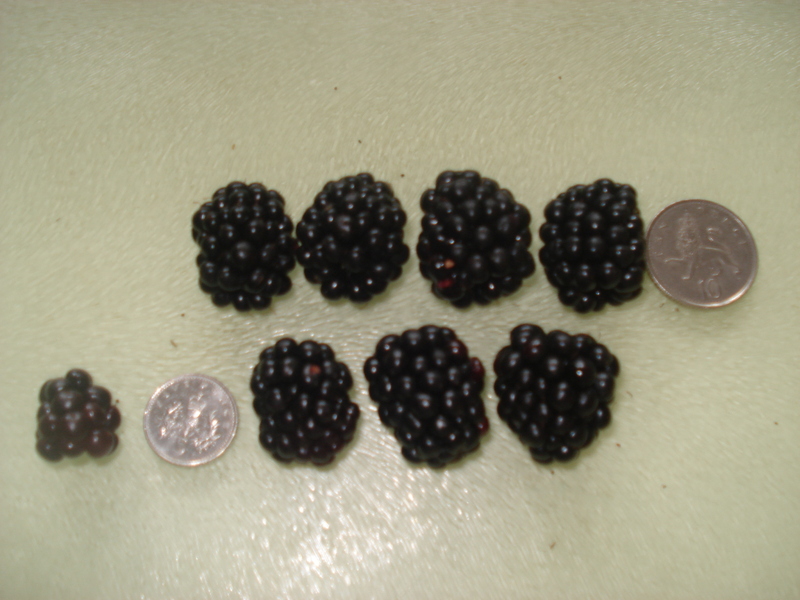 The blackberries are not only plentiful but enormous. Some the size of a 10p piece. 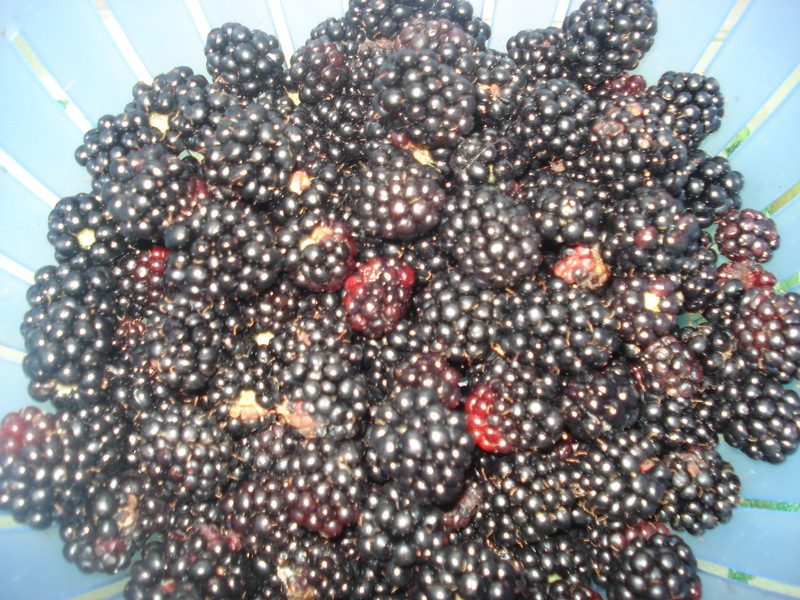 The wild blackberries are more like a 5p piece. Last night I picked the biggest ones out and we ate them raw with some creme fraiche, they were delicious, but today I picked some apples from our Bramley apple tree and cooked up some apple and the remaining blackberries with them, to freeze and to turn into blackberry and apple crumble later in the year. So now, not only do I not have to go foraging for wild blackberries in the hedgerows, but I no longer regret planting this blackberry plant, as it is producing bountious beautiful blackberries. 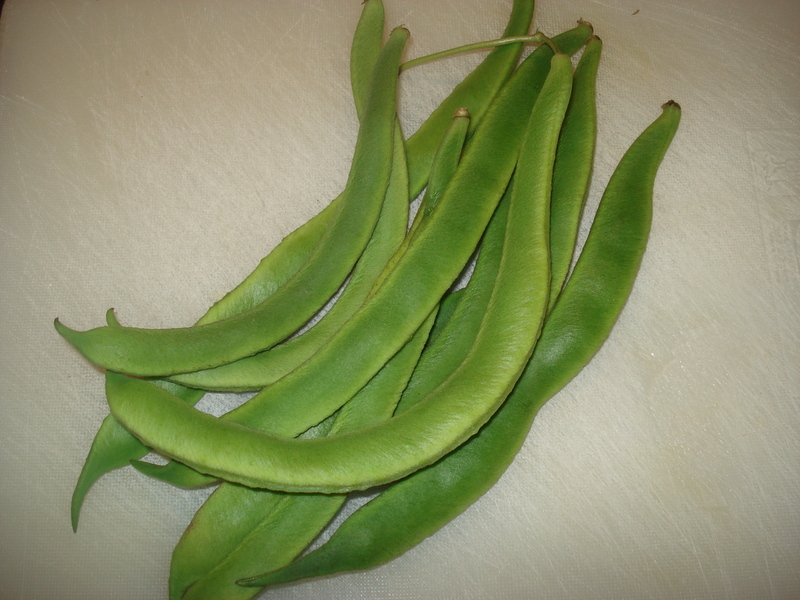 A couple of days ago I picked our first runner beans, just small tasty ones, but they are coming on nicely now. They had a slow start what with all our cold rainy weather, but all the rain water did them good. So we had dinner that night with our own runner beans, our own potatoes, and our own peas, followed by our own raspberries, so we really are eating from the garden. My very own “Pick your own” at home!! 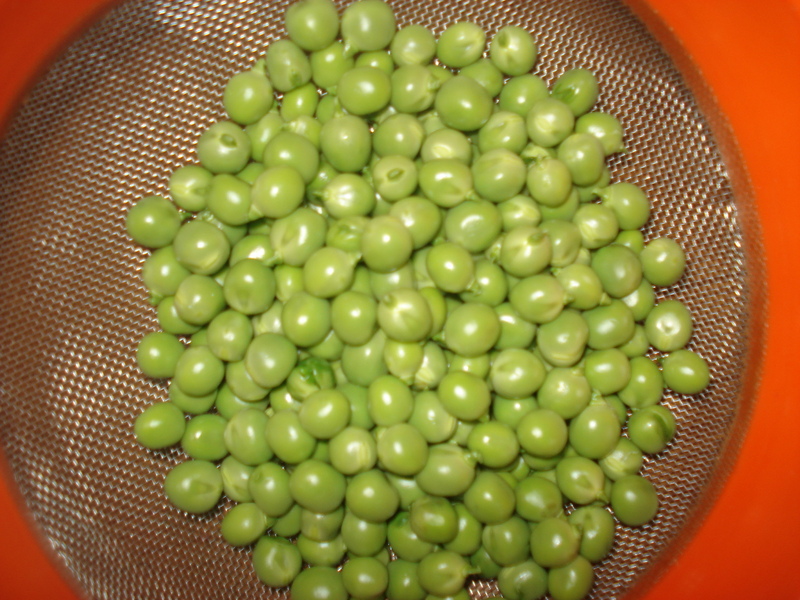 I’ve been sitting shelling peas and topping and tailing gooesberries whilst watched the Olympics. It’s been really exciting with team GB doing so well. 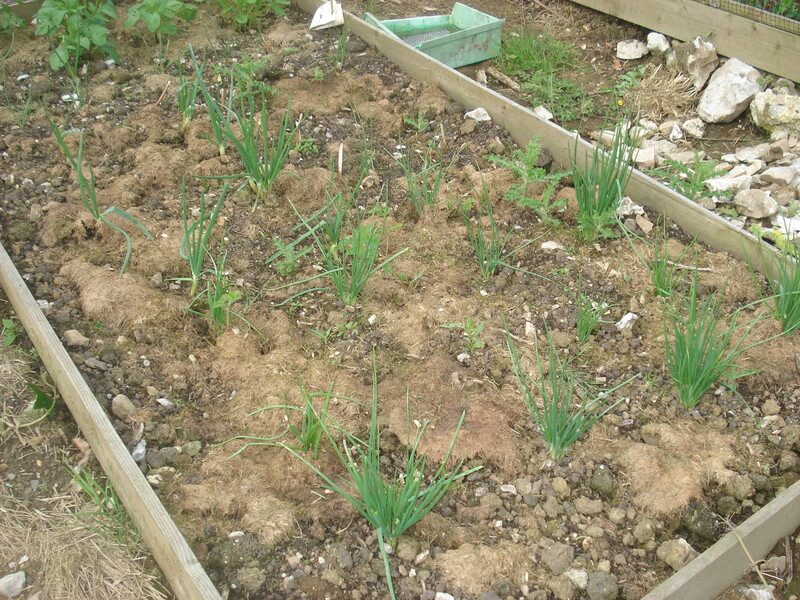 It’s time to dig up the first of the onions and we have cabbages, spinach, and other brassicas coming along nicely. I love eating from the garden, no food miles, just food feet!! We have had a week of lovely sunny weather here and it has done the garden good, bringing on the fruit and veggies after all the rain we have had. 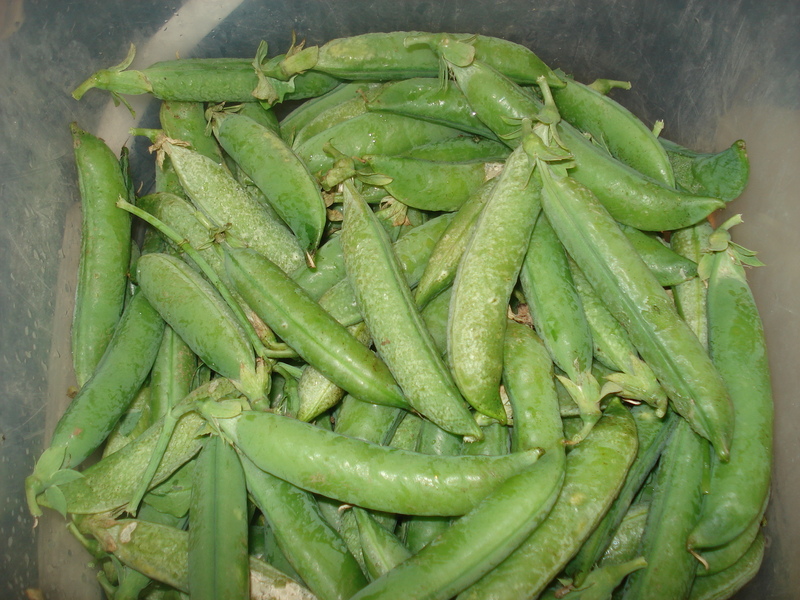 Yesterday we picked our first peas. They were lovely fat pods of really sweet peas. 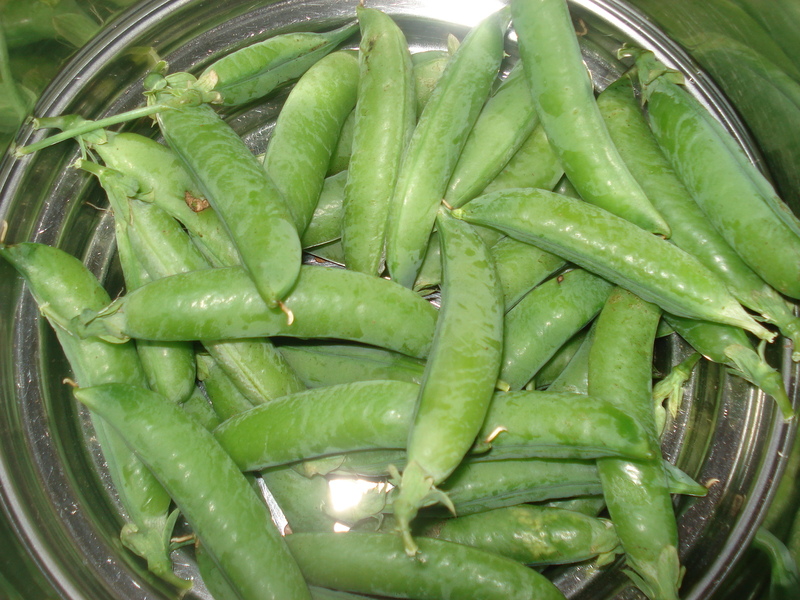 We have never grown peas before so this is a definite success. 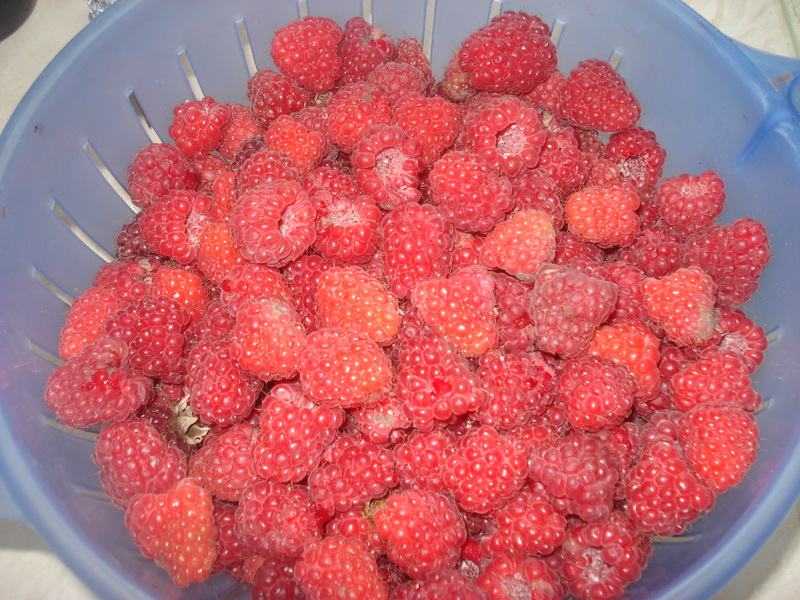 We had them last night with baked trout and our home grown potatoes – yummy, followed by home grown raspberries that have been so abundant this year we have been eating them daily. We have the raspberries served with meringues and squirty cream, an unbeatable combination. Not only do we have raspberries but loganberries and for the first time tayberries, which are a cross between a raspberry and a blackberry, so quite dark in colour. 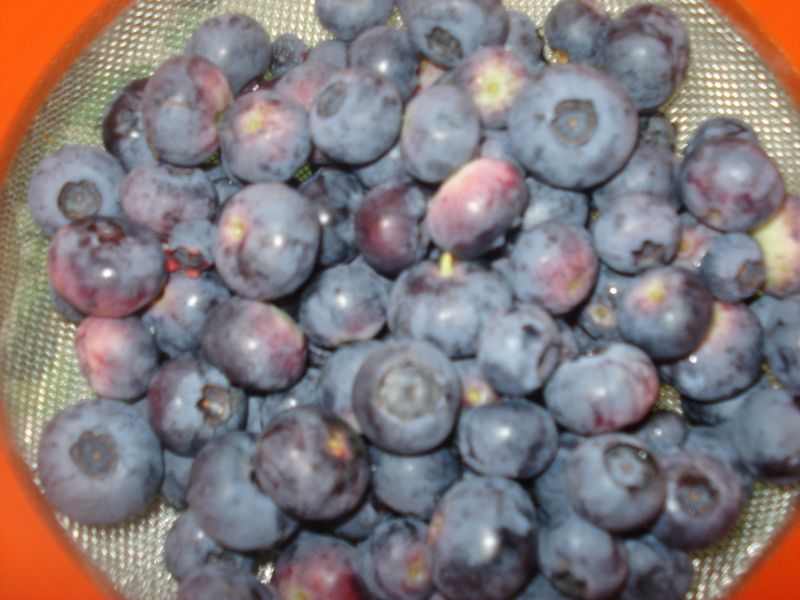 Also the blueberries have been plentiful. I think all the rain made them swell up, we have never had so many big ones. 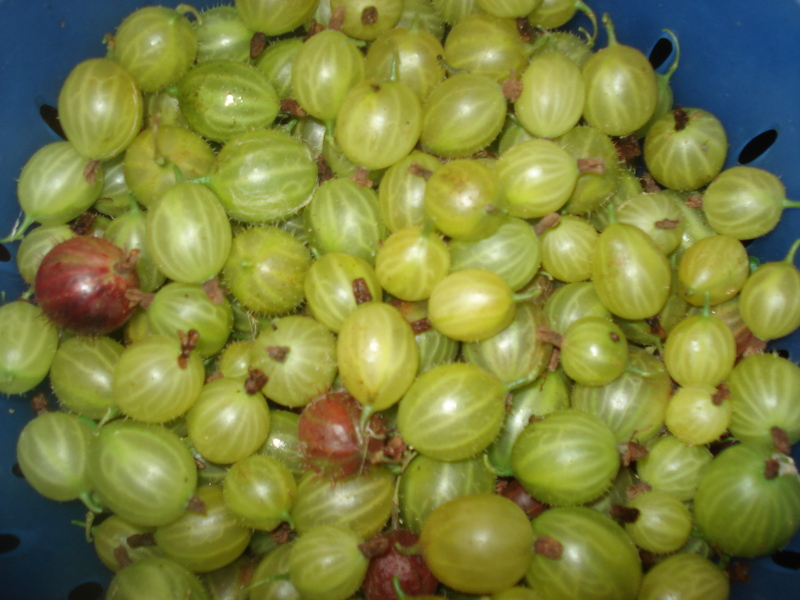 Our gooseberries are now ripe and I have been picking both green ones and red ones. I made strawberry and gooseberry jam with some of the green ones and raspberry and red gooseberry jam with the others. So what with the blackcurrants and strawberries we had earlier our fruit garden has been bountiful. With regard to veggies as I said we have harvested peas and potatoes, our beans and cabbages are coming along OK and we have had several courgettes, but our sweetcorn doesn’t look up to much, got dashed down by the rain we had, and the seeds of our carrots, parsnips and beetroot have all come to nothing. Also there are very few apples on the trees. Our British weather has a lot to answer for, but we must be grateful for the fruits we do have! !